Jeff Reed fights paper towel dispenser… and loses. 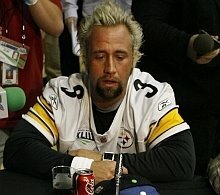 NEW ALEXANDRIA, Pa. – Two-time Super Bowl champion Jeff Reed faces criminal charges this weekend after an alleged incident in Westmoreland County. Reed, 29, one of the most effective field goal kickers in the NFL, was charged with disorderly conduct and criminal mischief shortly before 3 a.m. Saturday. According to a state police press release, Reed damaged a towel dispenser inside the men’s room at a Sheetz gas station on Route 22 in New Alexandria after he became infuriated that it did not contain towels. Store employees told state police that they heard Reed “banging on something and that it was really loud.” The employees said Reed then left the bathroom “using profane language in a loud manner” and stating that there were no towels in the restroom. So I’m going to ask the obvious question here: What the hell is a super bowl winning kicker doing at Sheetz in New Alexandria, PA at 3 in the morning? I mean we all know that sheetz is a wonderful third option to Taco Bell and Sonic when you’re drunk, but his team just won the super bowl. He can afford better midnight snacks than college students. Though in his defense, he was pissed at the paper towel dispenser for not having towels. I mean that the dispenser’s only job. Hold towels. It didn’t do it’s job. I’m sure the manager had a talk with the dispenser and told it that it was slacking off at it’s job and that if it didn’t work hard, there are many other paper towel dispensers that can take it’s place. Gotta love the frosted tips, too. Nothing but the classiest in Pittsburgh. You are currently browsing the archives for the sheetz category.